When thinking about the Vatican’s art collection, one’s mind turns to Michelangelo, Caravaggio, Raphael and Titian rather than nameless artists/artisans from Africa, Oceania and early Americas. Yet, those nameless artisans are the creators of the fascinating works now on display at the de Young Museum’s new exhibit. While the Vatican Ethnological Museum is being renovated, 39 ceremonial objects from its nearly 100,000-piece collection are on display in San Francisco. An eclectic mix of cultures produced over more than four centuries are included in this show, such as aboriginal objects from Australia, painted wooden figural sculptures from Papua New Guinea, African tribal masks, Aztec deities, and paintings by North American Indians. The show is mounted adjacent to the de Young’s strong permanent collection from Africa, Oceania, and the Americas, which takes up more than one-half of the museum’s total gallery space. Rather than rush to the new exhibit, you might consider wandering through the permanent collection to gain some perspective on the Vatican’s objects. In fact, late Museum Director John Buchanan visited the Vatican to choose works that would complement the de Young’s collection. The “Objects of Belief” central theme of worldwide indigenous religious cultures combines pieces from different times, different beliefs and different locales. Despite their disparate origins, the 39 examples seem to share an artistic commonality. The works share similar materials and subject matters, although their artistry differs greatly. Only one work in the show has Christian symbology. It’s a late seventeenth century bronze crucifix showing Jesus as an African, made in the region now known as the Democratic Republic of the Congo. Of special note is the attractive and intricately carved bowl and lid made in the nineteenth century on the Marquesas Islands of French Polynesia. 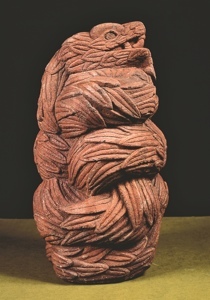 The red stone sculpture embodying the Aztec god Quetzalcoatl in his serpent form is the oldest piece on exhibit. It was referenced as being from the fifteenth century, yet the Vatican curator told me that it was created in the thirteenth century. In fact, one of the confusing aspects of the exhibition is the emphasis that has been placed on the year each piece was donated to the Vatican Ethnological Museum, rather than the year in which it was created. Also, the show’s small space may make the 39 objects difficult to see. “Objects of Belief” is the first exhibition to travel to the United States that consists solely of the Vatican’s works from continents and cultures beyond Europe. It will aid in the understanding of the local and global significance of the objects. But I’m still waiting for the Vatican to send over just a few paintings by Michelangelo, Caravaggio, Raphael and Titian.